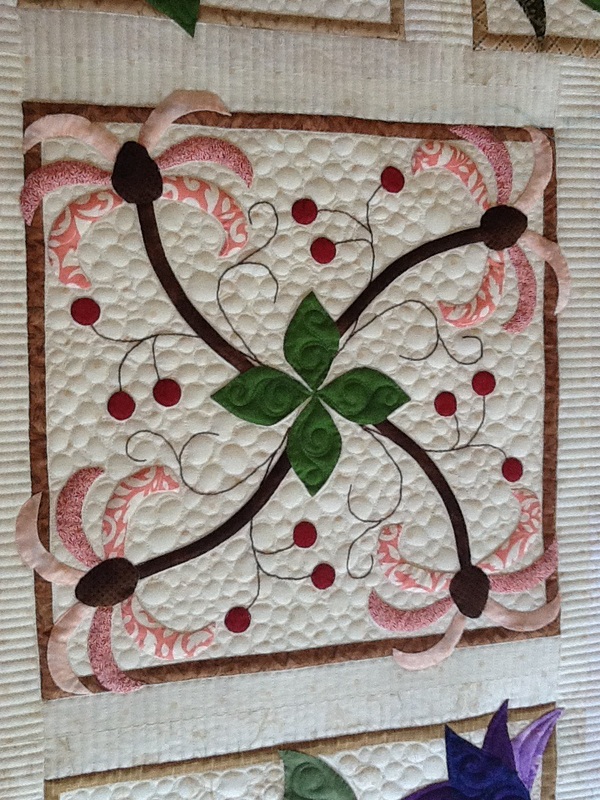 Here is another stunner pieced and appliquéd by Georgia. 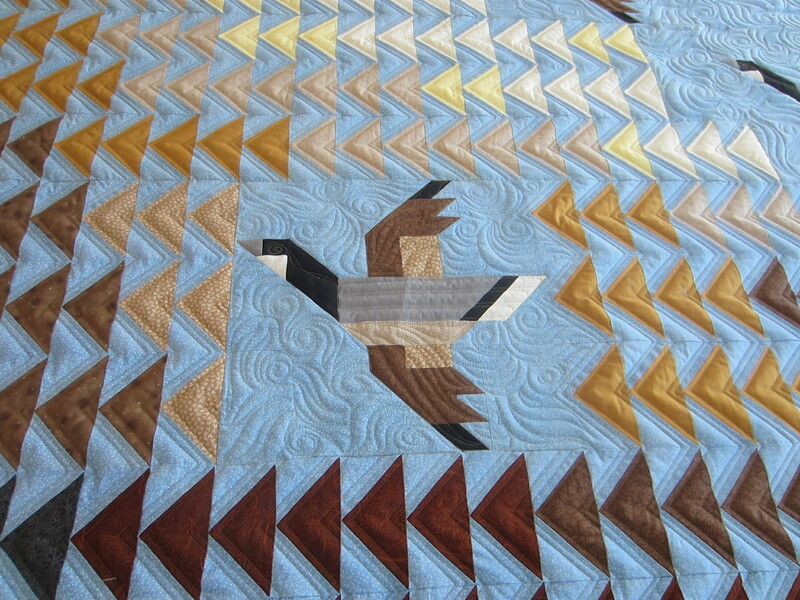 The piecing inspired much of my quilting. 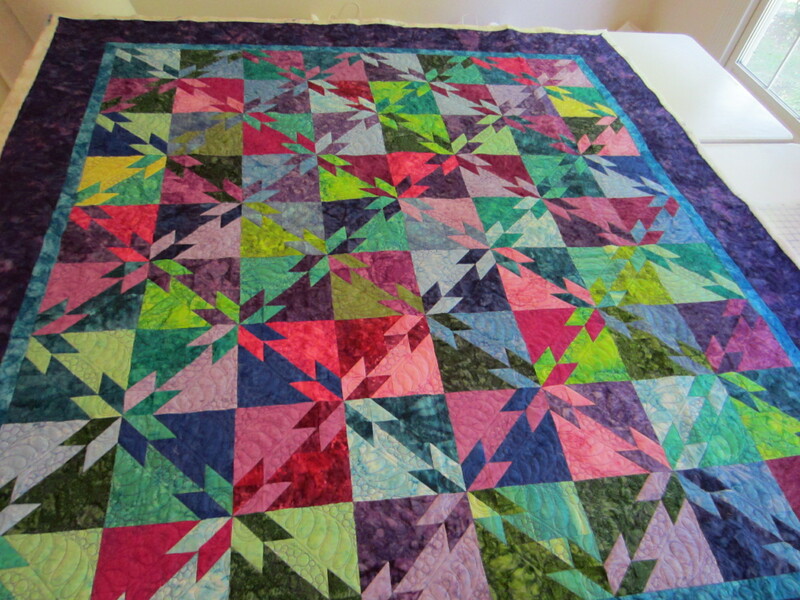 I recently finished a lovely quilt pieced by Sandy. I believe she said the pattern was by Pam Bono. It’s is quite large–about 88 x 110. It was hard to get it all in one photo. I think it is striking! 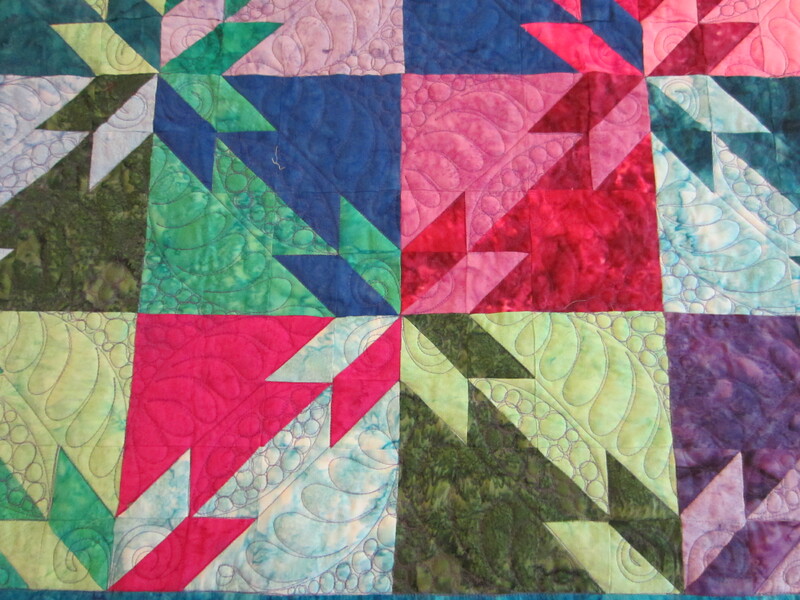 I did straight line quilting in the small pieced blocks. 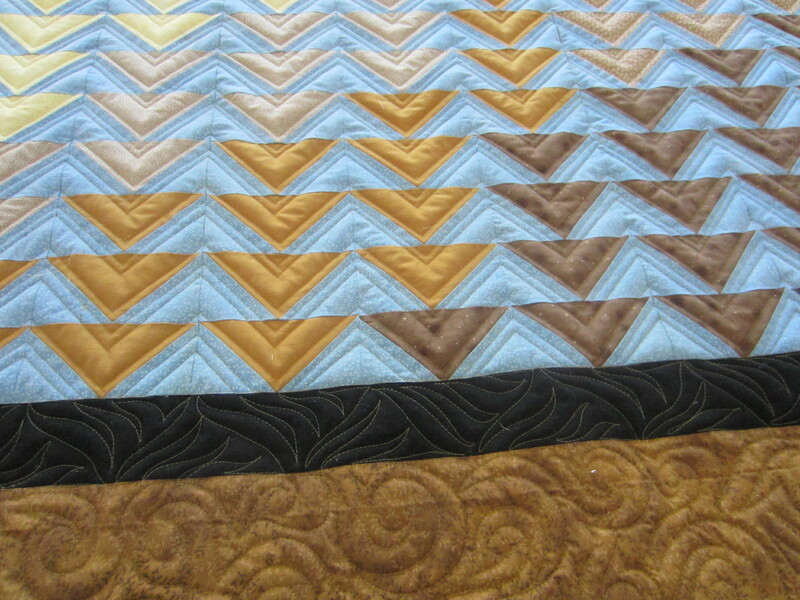 It gives it a chevron look. 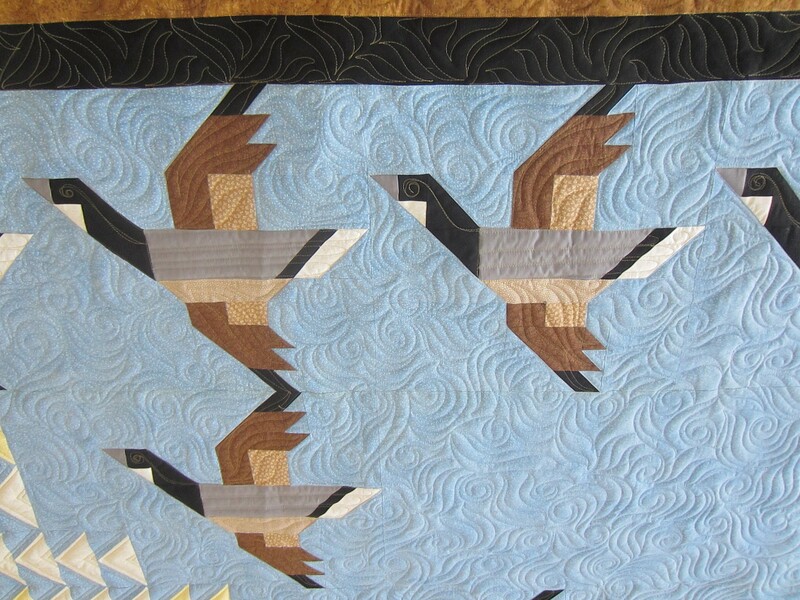 Swirly “wind” quilting behind the geese seemed a good choice. 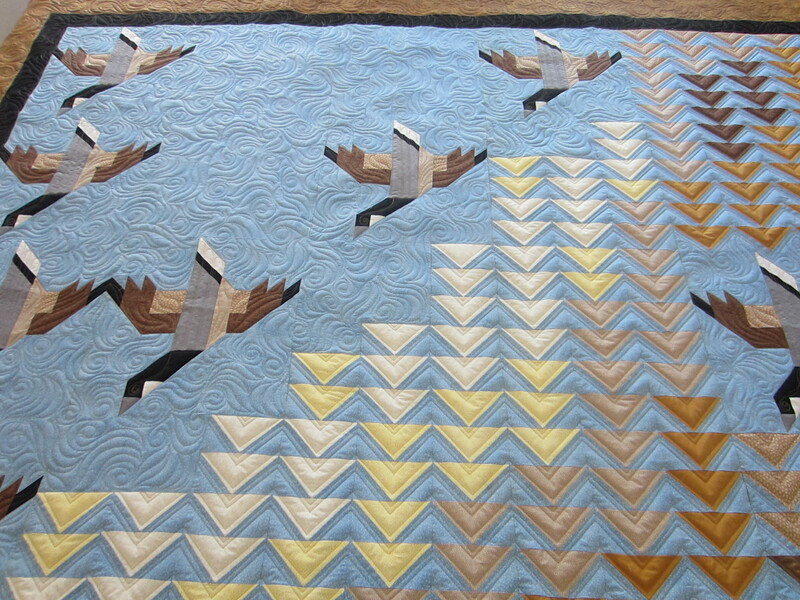 The fact that there are pieced geese along with flying geese blocks was not lost on me. Quite clever! Sandy said this is for her brother. 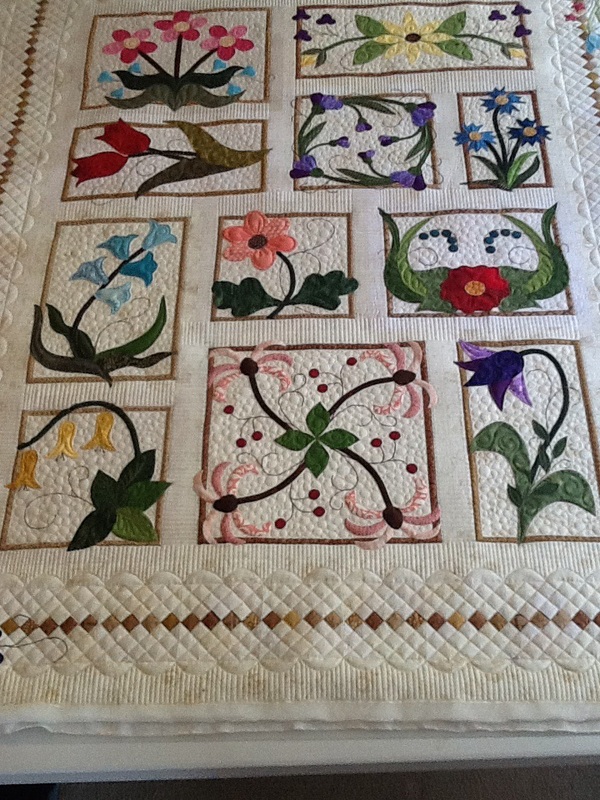 What a beautiful bed quilt it will make. 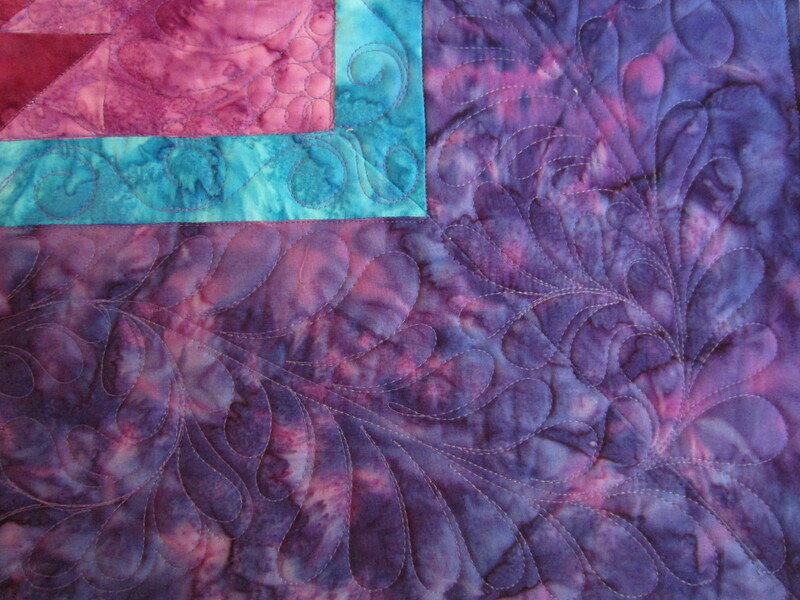 My watercolor brushes have been dry lately, but I have been quilting. 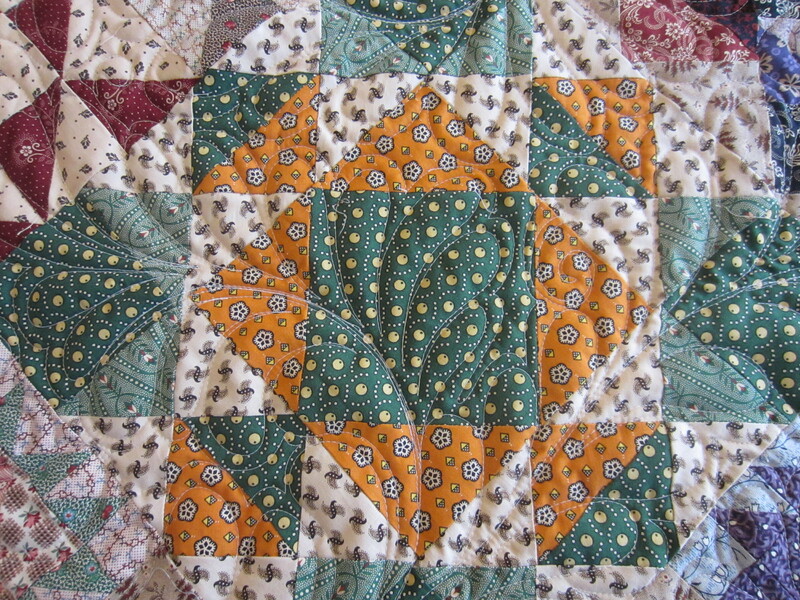 I don’t much like to follow quilt patterns. I feel like I should be more original. Must be the artist in me. 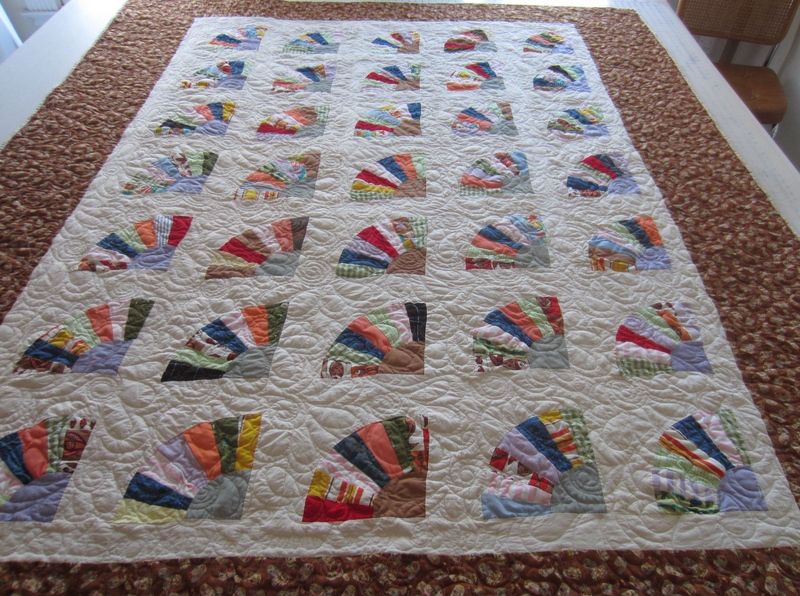 I designed this lap quilt (58″ x 70″) as a wedding gift for Natalie who is getting married tomorrow. 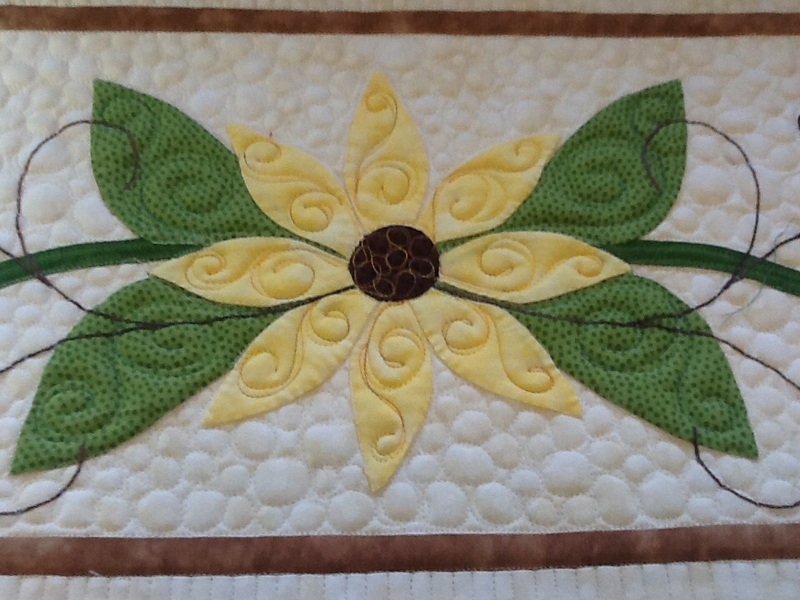 It’s a simple design with large (12″ x 14″) blocks. It was well received at her bridal shower this past week. Her requested colors were navy, mustard and blush. 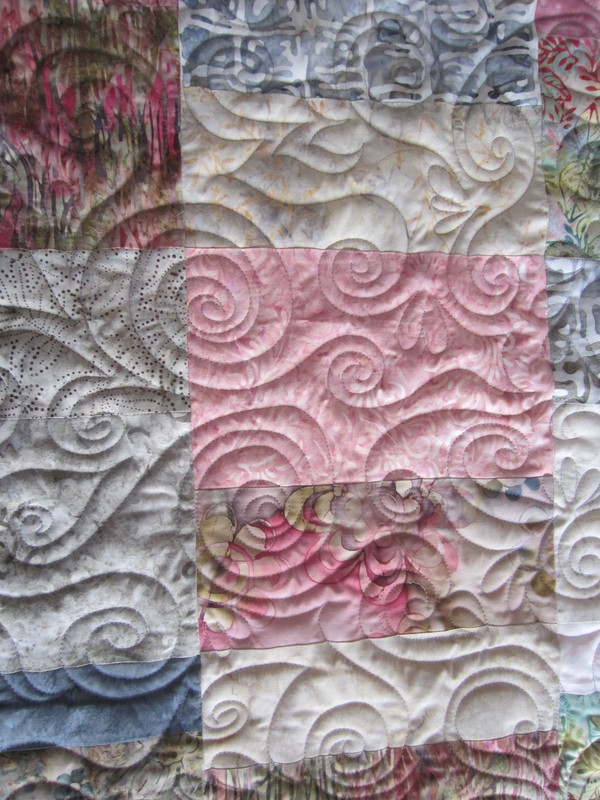 I was able to find a fat quarter bundle online: “Athena” by Angela Walters for Art Gallery Fabrics. It fit perfectly into this color scheme. 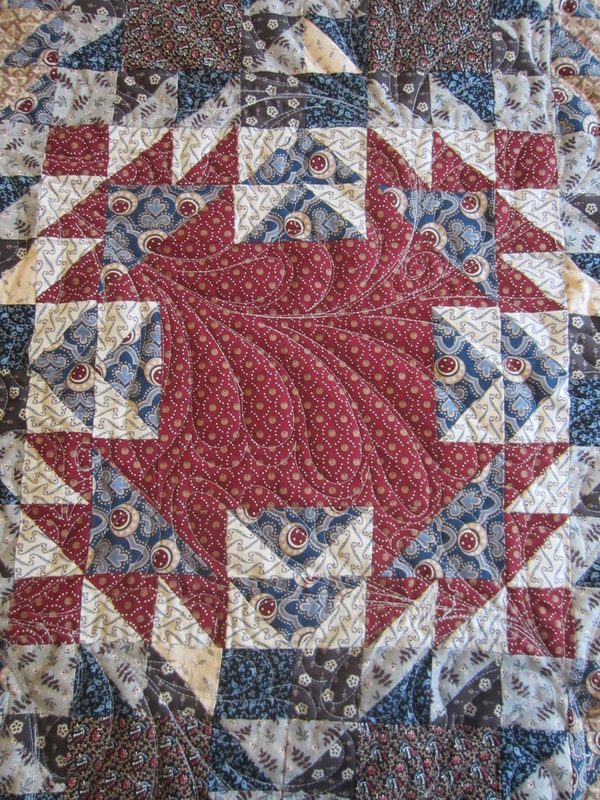 Since it was a wedding gift I quilted it with my all-over Curly Hearts pattern. 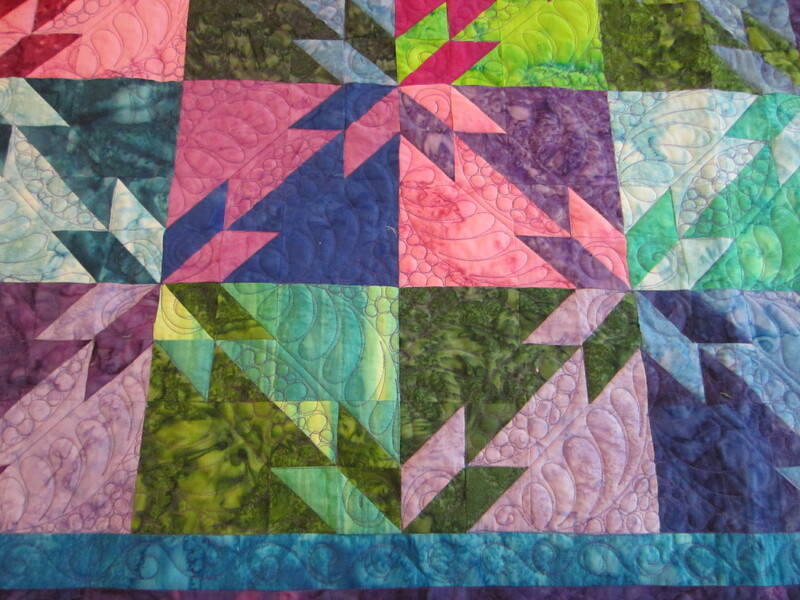 There was enough left over fabric to make a simple pieced back. 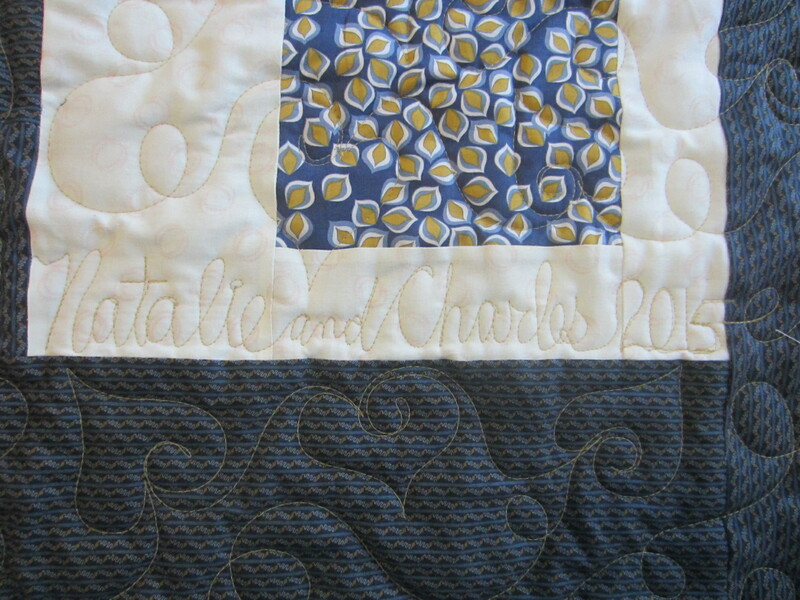 Hopefully Natalie and Charles will spend many an evening cuddled under this. Is it possible to make a silk purse out of a sow’s ear? 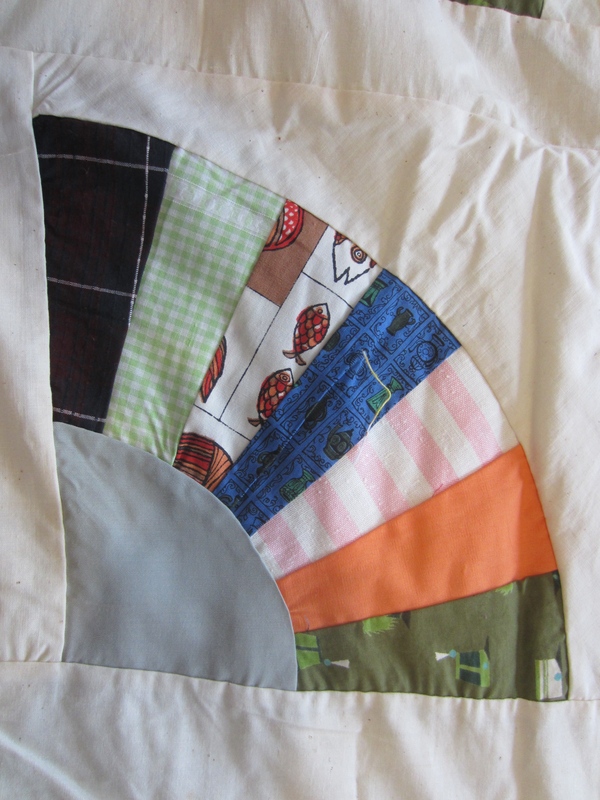 So what makes an ugly quilt? Ugly fabric? 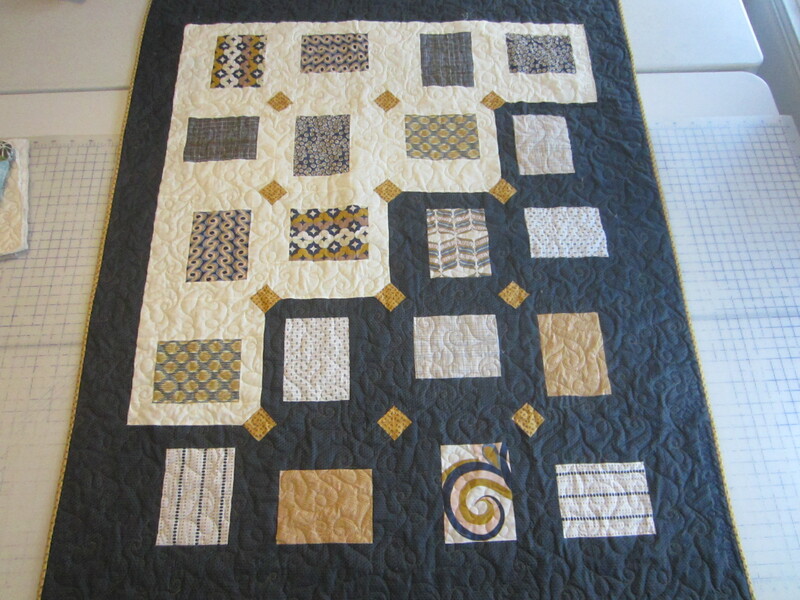 Poor piecing? Doesn’t lie flat and is crooked? Yes, this one had it all. 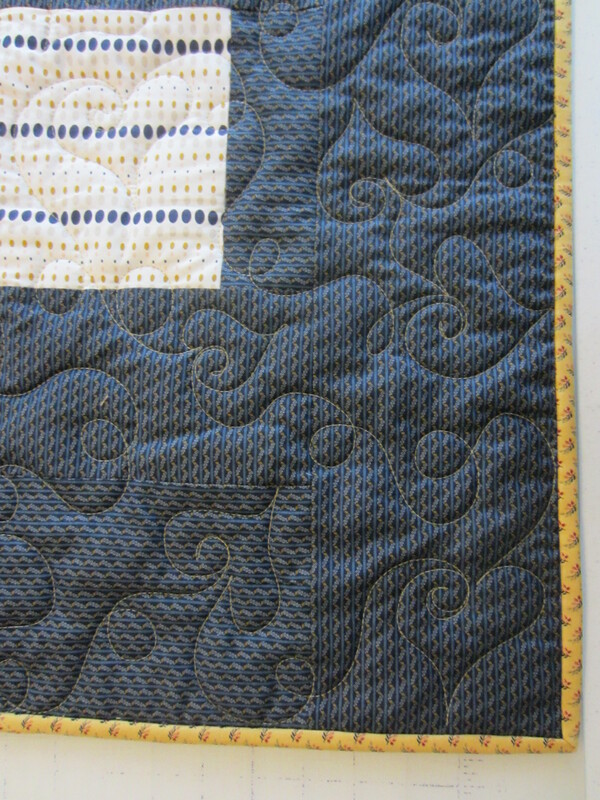 I saw no reason to go to the trouble of making it into a quilt. Not worth it. I’m guessing the fabrics are from the 70’s. At least there’s no double knit! I wasn’t going to do anything with it. 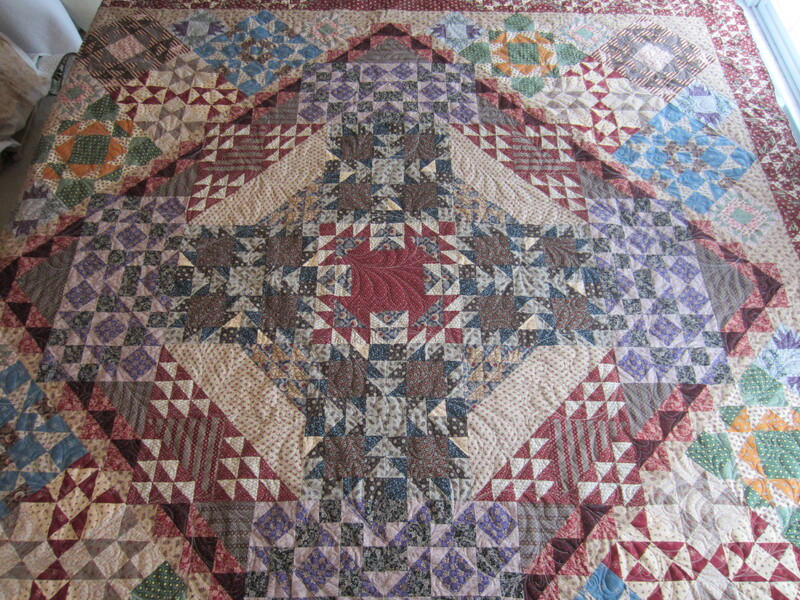 But then I had to consider that it was hand pieced by my sister-in-law’s grandmother. It has sentimental value. 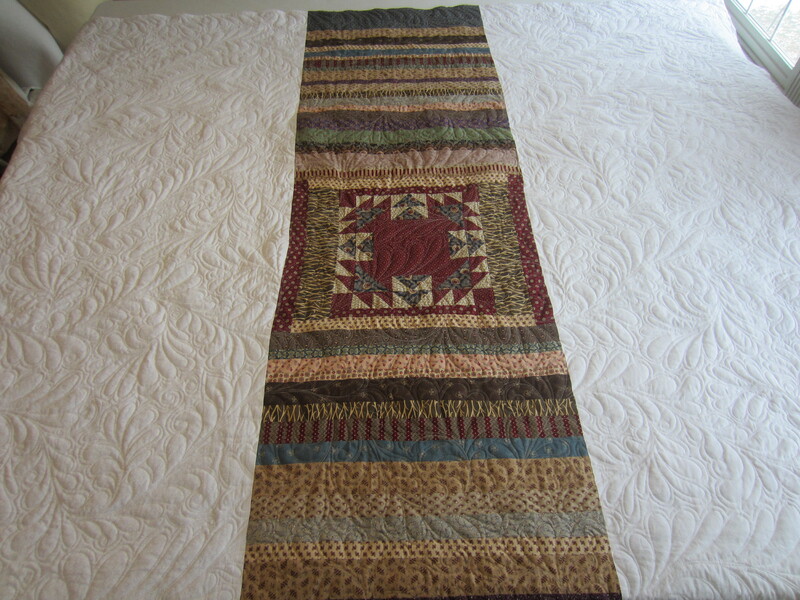 So I decided to finish it, add some wide borders (fabric I found in my stash) and make it into a bed quilt for my brother and his wife. It’s not so bad. 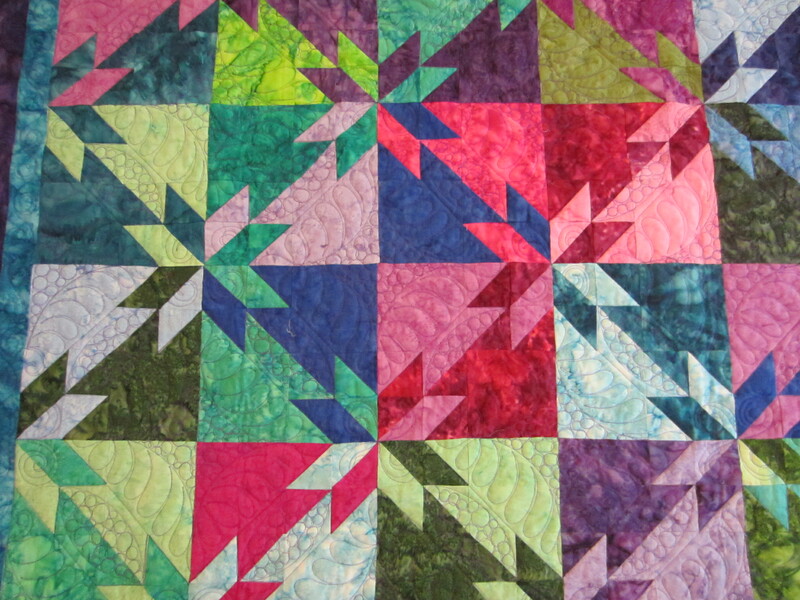 Tops always look better with quilting. Hope they like it. But I’m afraid it’s still crooked! 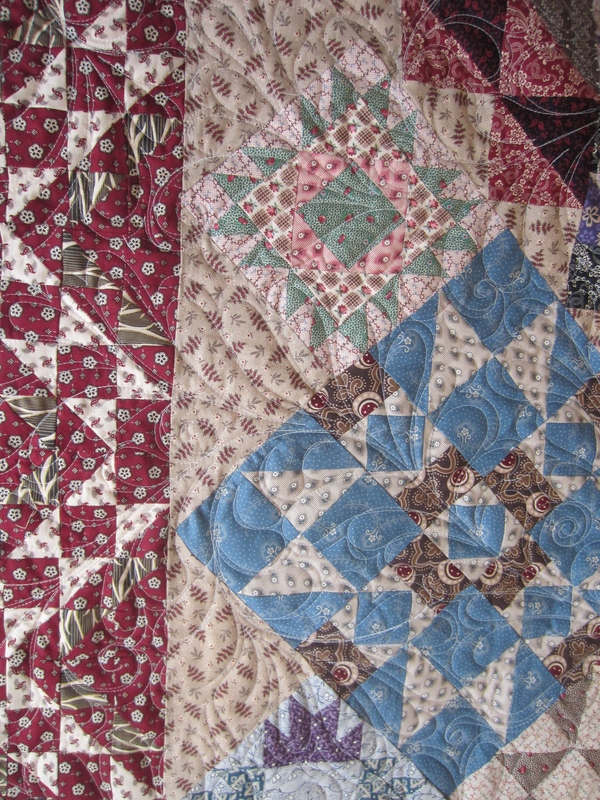 Here a couple of quilts I finished in the past week. This first is from Wanda. It was so large, I couldn’t even get it all in the picture. How long did this beauty take to piece?! I don’t think I would have the patience to finish this. 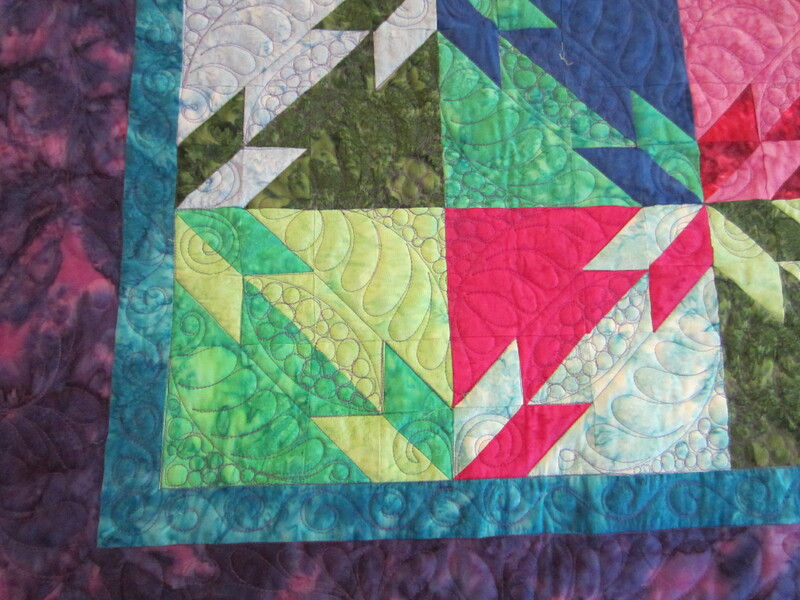 Good thing I just do the quilting. 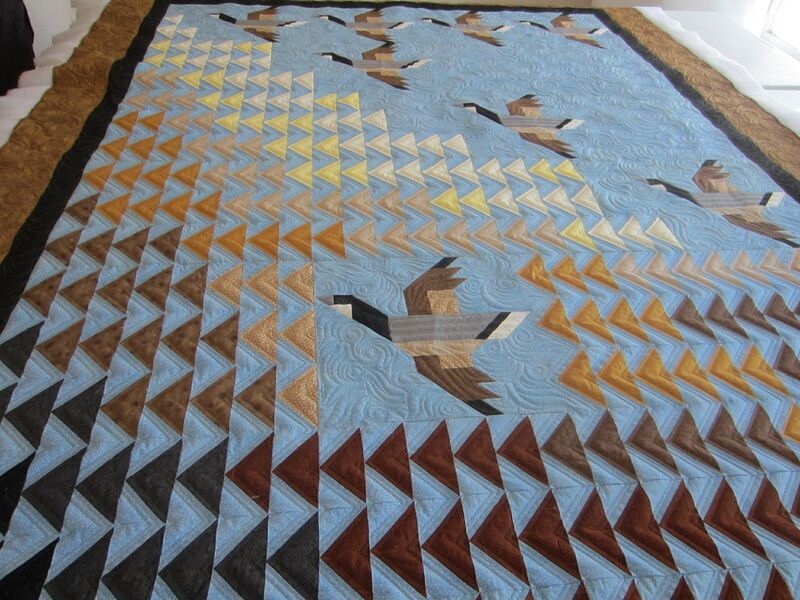 Since this is a very traditional quilt, I finished it with edge to edge feathers. 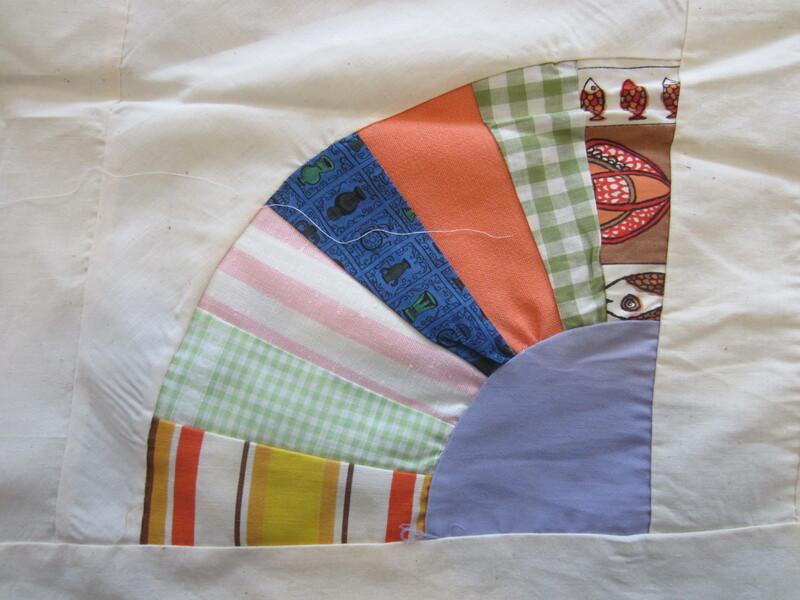 Beautiful fabrics, beautiful piecing. It’s always fun to find something interesting on the back. 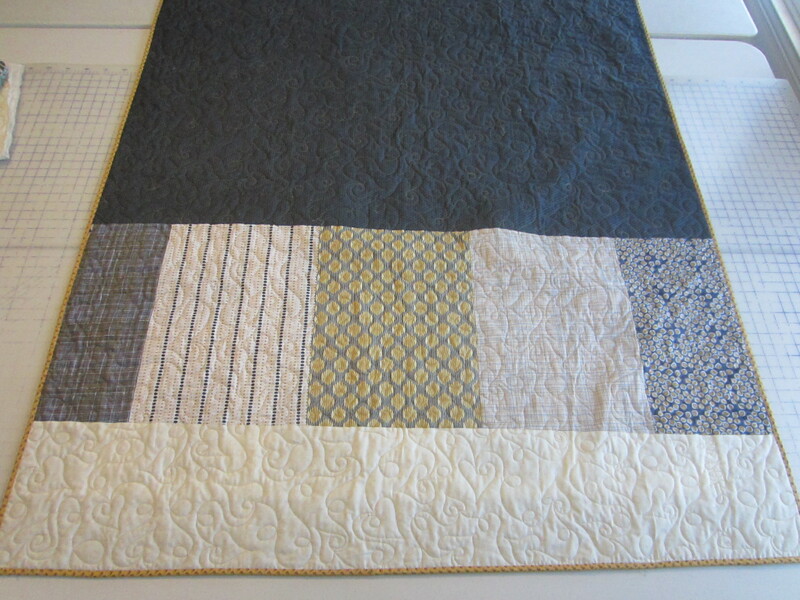 This next quilt was pieced by Penny. I like how she graduated the colors from light to dark. Very striking. I made up a new all over design for this one. You can see it better on the back. Don’t have a name for this pattern yet. Any suggestions? 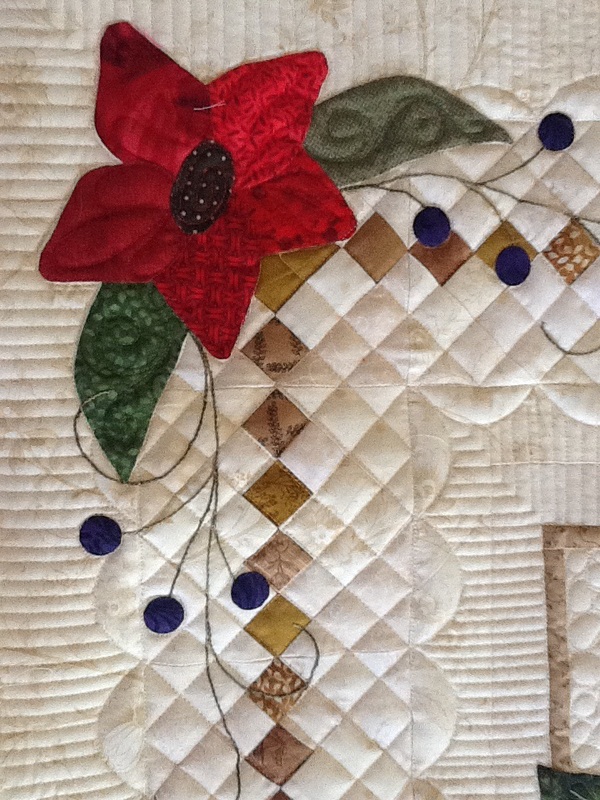 This painting started out as a sketch to explore quilting designs. 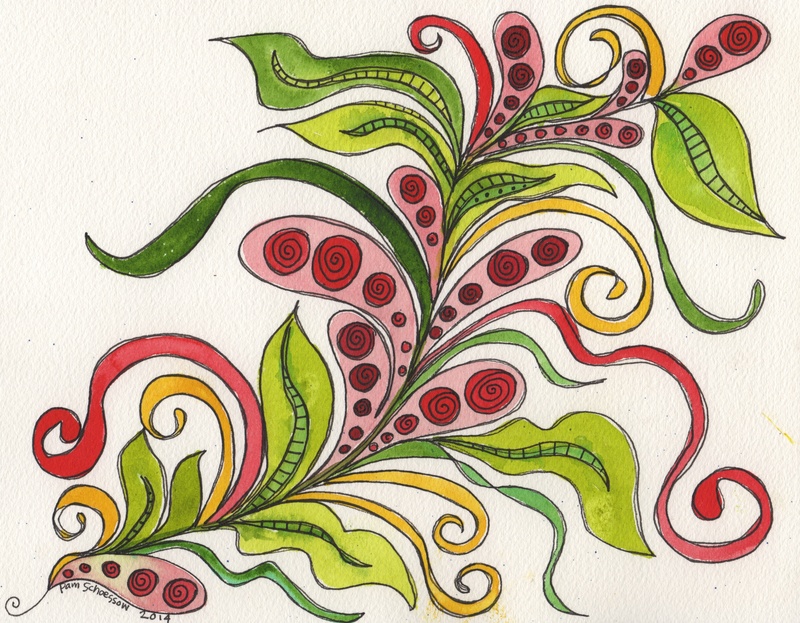 It incorporates a lot of fun elements–feathers, leaves, and ribbony curls. 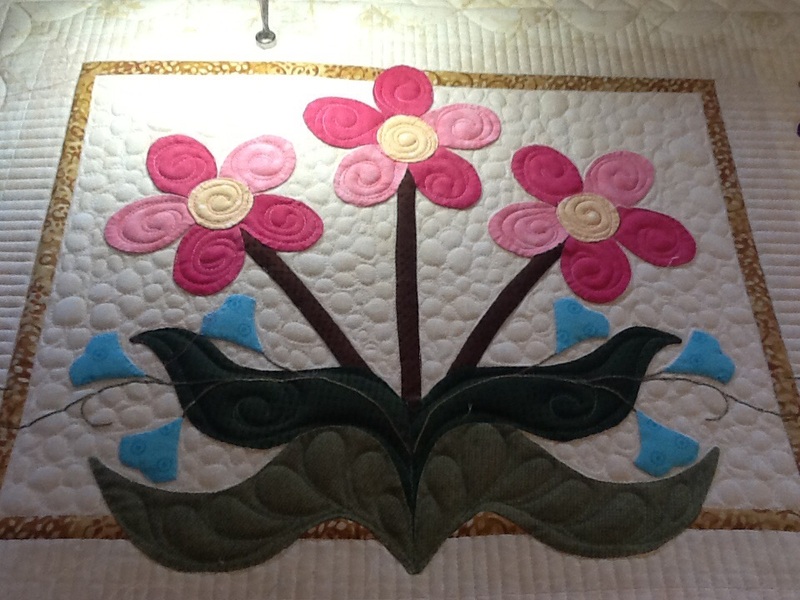 It’s the type of thing I would draw with my machine and is very indicative of my quilting style. Adding the color just makes it all the more fun. 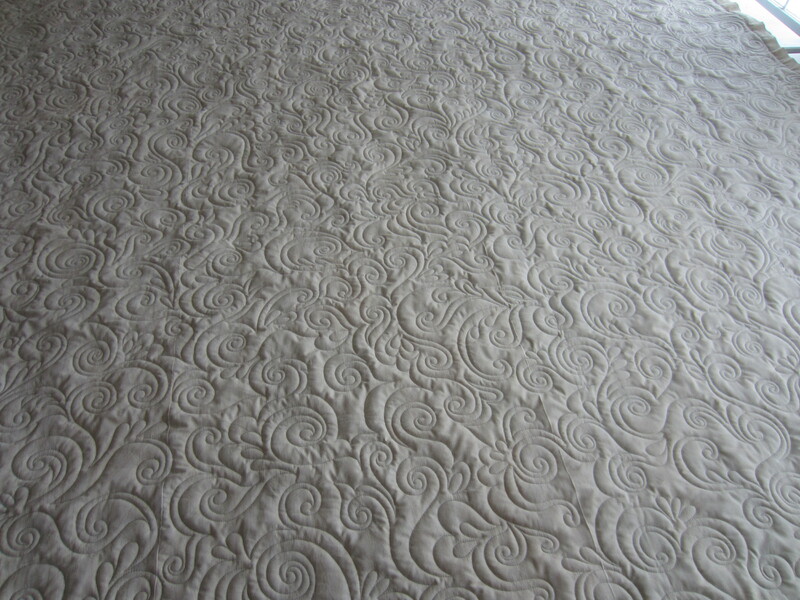 I finished quilting this beautiful quilt recently. 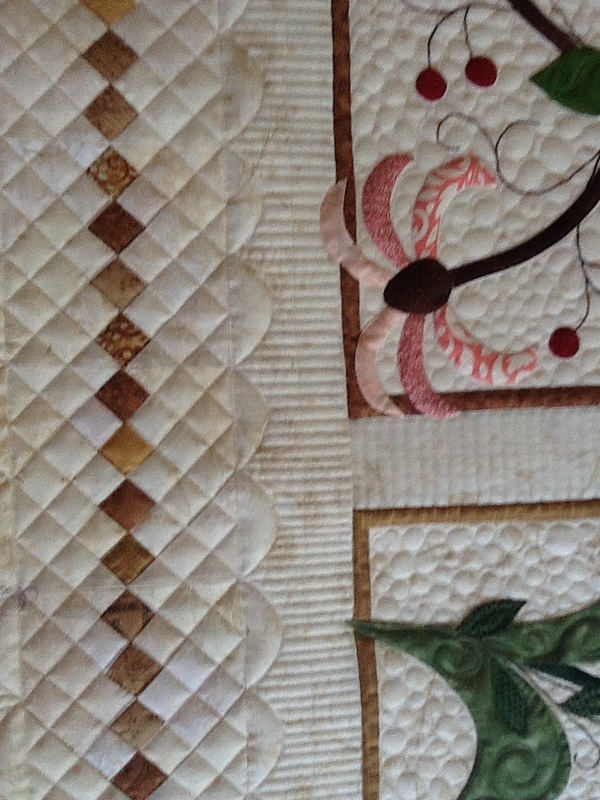 It was pieced by Judy, who did a fabulous job. 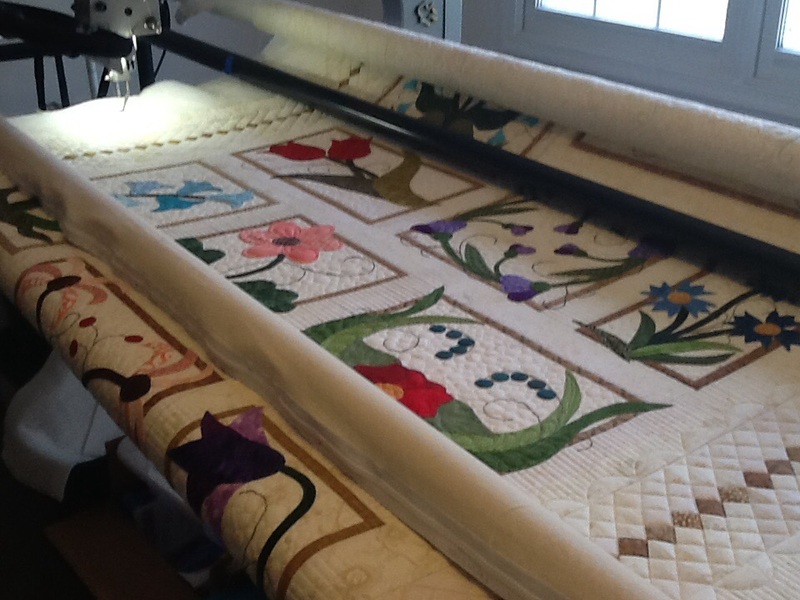 It’s always a pleasure to quilt a well pieced top. I believe this is the Hunters Star block. I used some circle templates to get the nice curves. The feathers and pebbles are all done free-hand. That’s the part I like best. 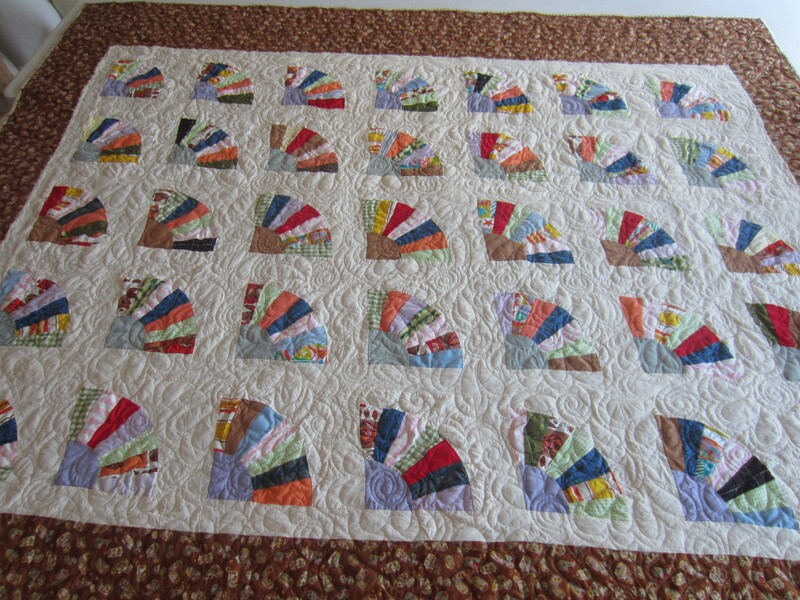 I put feathers in the borders also. 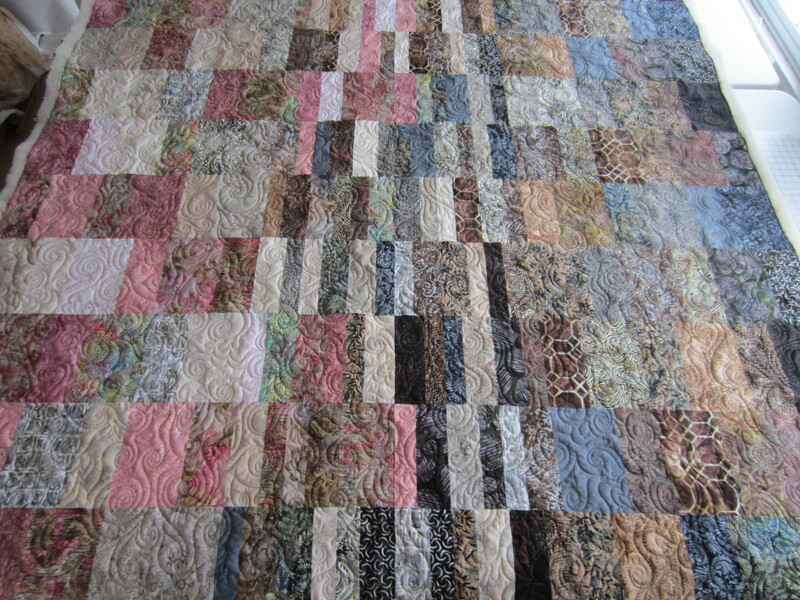 This quilt actually took quite a while to finish, but I am happy with the results. Purple lovers enjoy!